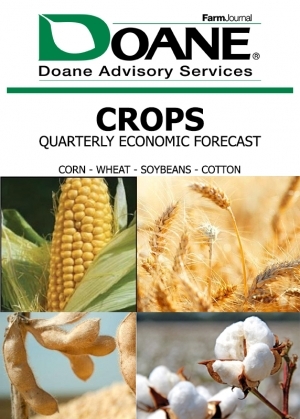 Product Details Gain access to Doane’s respected and anticipated five-year forecasts for acreage, price, production, consumption, trade and stocks for the major crops in the U.S in this Quarterly Crop Outlook report. Acreage forecasts for: corn, wheat, soybeans and cotton. Relied on for unbiased, trusted analysis by agribusinesses and financial firms, food processors and procurement representatives, and others that are impacted by developments in U.S. crop markets. This report is available via immediate download at the completion of your order.